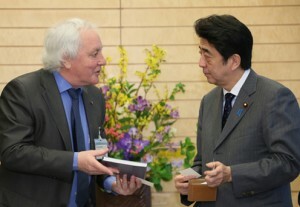 One year ago, Lyn Evans paid a courtesy visit to Japan’s Prime Minister to Shinzo Abe. “Those who do not learn from history are doomed to repeat it” is a misquotation from George Santayana (1863 – 1952). Very suitably for the Linear Collider Collaboration (LCC), he was a writer with an international perspective who always considered himself both Spanish and American. These words came into my mind when I received an email from Sachio Komamiya, chair of the Linear Collider Board (LCB), with the news that the LCB wanted me to chair a group to take another look at issues relating to ILC governance. The production of the Project Implementation and Planning (PIP) document back in 2011 by a group led by Mike Harrison contained what I had hoped would be the last word on governance of the ILC. This was of course naive; new projects arrive, new ideas are aired, new political and legal instruments appear. For example, the ERIC legal framework for multinational scientific infrastructures produced by the European Union was only an idea when we produced the PIP. The biggest change of course is that we wrote the PIP without any idea of which state might host the ILC. Now that we have great hopes that Japan will soon step forward, the case to revisit some of the ideas of the PIP seems timely. Sachio is also a very persuasive man. There is a lot of experience here both of running major laboratories and major particle physics projects as well as interacting with the Japanese government at many different levels. We will certainly exploit this expertise as our work progresses. Getting a group of busy people like this together when they are scattered across many time zones is always a challenge, but one that long experience with the former Global Design Effort enables us to meet. We held our first meeting last week, attended by all but two of the group members. It was a helpful and positive beginning: we reviewed the work done for the PIP and tried to identify areas where there had been developments. One such is the European Spallation Source (ESS), which was in a very early stage when we drafted the governance section of the PIP; Colin Carlile has agreed to bring us up to date with that. Another project which is regularly in the headlines, rarely for the right reasons, is ITER; once again we were able to identify recent relevant documentation that the panel will study for our next meeting. Those panel members who did not already subscribe to LC NewsLine agreed to sign up, recognising its value as a source of news but also the archive as a quick way for those who are not so familiar with the project to catch up. We were fortunate that both Sachio and Satoru were able to give us an update on the current situation with regard both to the site process in Japan and the current activities, predominantly of MEXT, in contacting and discussing the ILC project with other governments and funding authorities. We were also fortunate that Jonathan and Neil agreed to produce a document describing the experience gained in the setting up of the Okinawa Institute of Science and Technology (OIST), an international organisation with a Japanese site. The foundation of such a complex entity required very close liaison with several parts of the Japanese government. Although Universities are different in many ways to major science facilities such as the ILC, nevertheless there are also many parallels with the processes we will have to go through to make the ILC a reality.